For more than a year this Potterton Prima 80F gas boiler had been giving trouble firing up. The fan would start then stop, start then stop and keep repeating this for some time before the boiler would fire up. This fault is common on both Potterton Prima F boilers and Potterton Profile boilers and we’ve seen a similar fault on a Baxi Solo PF boiler too. In the case of this Prima 80F the fan had been cycling on and off every 4 or 5 seconds. When we arrived to look at the boiler it wasn’t showing this classic fault. 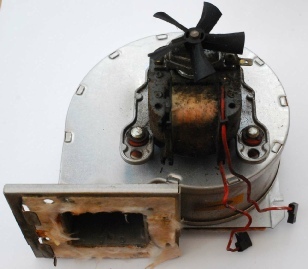 The fan was running, but very slowly. We measured the voltage between Live and Neutral at the fan and found 238V AC which is correct. Because the fan was running a long way under speed even though the supply voltage was fine, we changed the fan. The new fan ran much faster but promptly started cycling on and off again, every few seconds, without completing the ignition cycle. 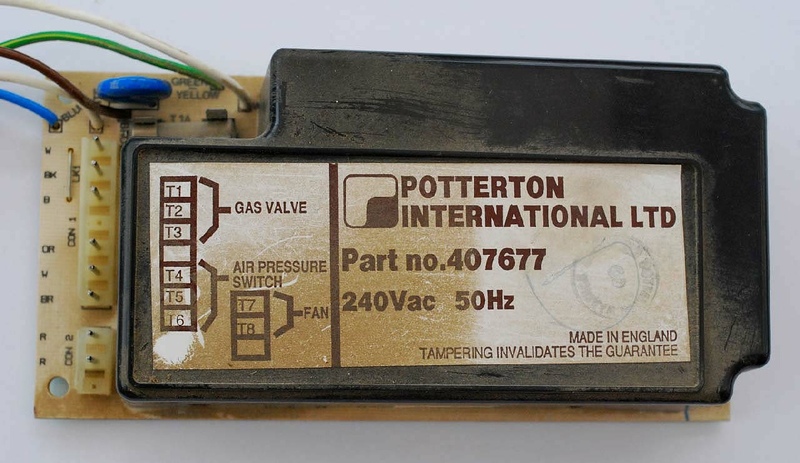 The commonest cause of this fault on Potterton Profile boilers and on Potterton Prima F boilers, is the circuit board (PCB). 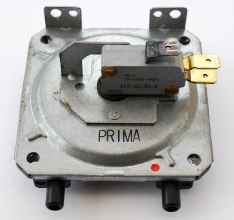 Both the Profile boiler and the Prima F boiler share the same circuit board (Potterton part No. 407677). However, before changing the PCB we decided to check the air pressure switch (APS). 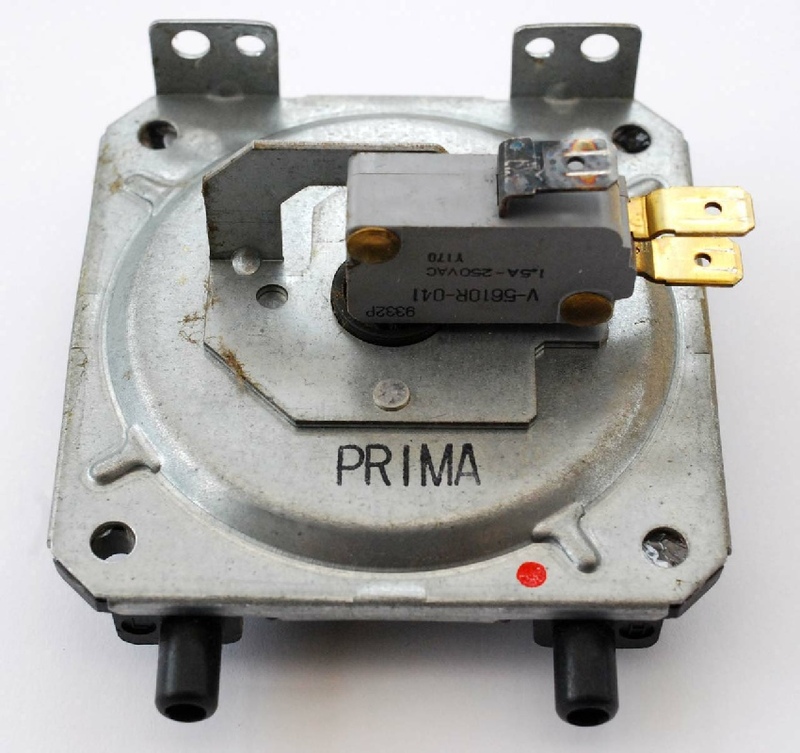 The Prima F air pressure switch has 3 electrical contacts: Common (C), Normally Closed (NC) and Normally Open (NO). The “normal” state is the de-energised state, when the fan is not running. The APS is designed to prove that the fan is operating correctly; that it has cleared any residual unburnt gas from the combustion chamber and is providing the right amount of combustion air before the spark ignition starts. 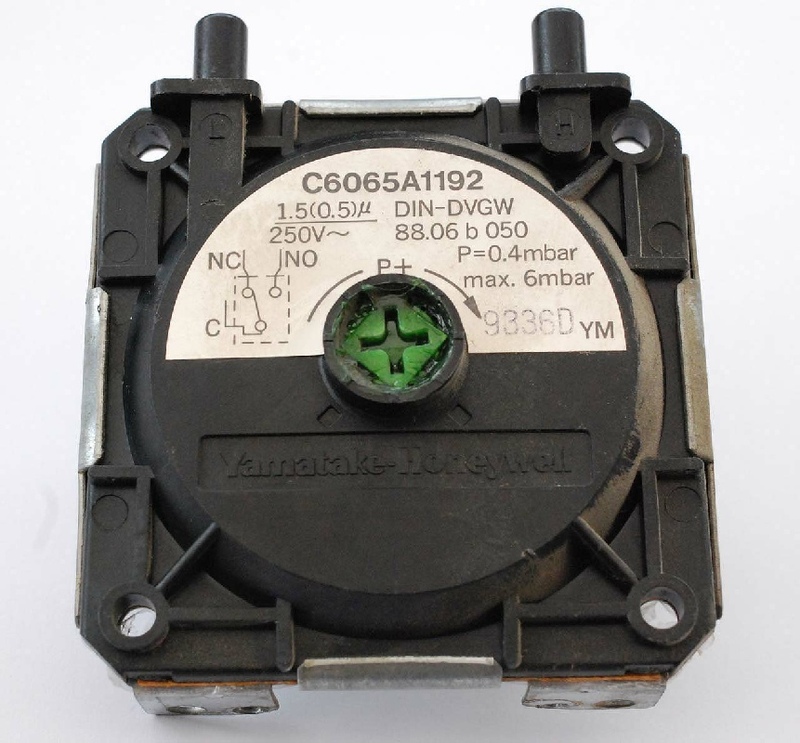 With the fan running, the air pressure switch should move so that it connects C with NO, allowing the ignition to start. 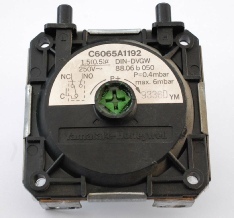 To eliminate the risk that the APS contacts have been stuck in this position, the circuit board initially checks that, before the fan starts, the APS contacts are in the alternative position, connecting C with NC. With the APS disconnected it’s possible to check that the switch moves correctly and makes the contacts as it should. We set our multimeter to check continuity and give an audible tone. Then we checked between C and NC and proved they were in contact. Using a small tube gently to blow air into the switch we checked whether the switch moved to connect C with NO. Although the switch seemed to move, the tone was very inconsistent, suggesting that the contacts in the switch were damaged or dirty. We ran the same test on a new APS which worked perfectly so we fitted the new APS, thinking we had solved the problem, but with no joy. The fan continued to cycle on and off every few seconds. That left us with the PCB (the printed circuit board). 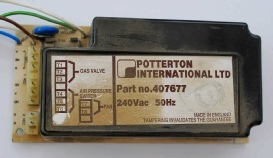 We fitted a new, genuine Potterton Interpart PCB (part No. 407677) but still had the same problem with the fan cycling. Besides the fan and APS, many other components interact with the PCB, including the overheat thermostat (limit stat) and the main boiler stat. We disconnected the the limit stat contacts and bridged them out and tested again but the problem with the fan cycling continued. However, on reconnecting the limit stat the boiler worked normally. This suggested that the problem may have been corroded contacts at the limit stat. The boiler was 16 years old so dirty contact was a possibility. One of the contacts on the air pressure switch was also very corroded (see photo left). Wanting to know whether the old PCB really had been faulty, we swapped the new board out and re-fitted the the original circuit board. The problem came straight back. Once again we swapped the boards, leaving the new PCB in the boiler, and the fan cycling fault again disappeared. That’s how we left it and we haven’t heard of any further problem with it yet! Several times we’ve had to change more than one component to eliminate this fault but this is the first time we’ve had to change three components and probably had contaminated electrical contacts on a fourth.